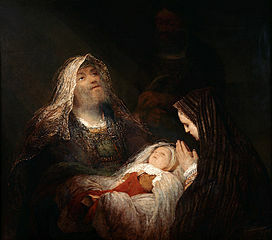 25 At this time a man named Simeon was living in Jerusalem. Simeon was a good man. He loved God and was waiting for God to save the people of Israel. God’s Spirit came to him 26 and told him that he would not die until he had seen Christ the Lord. This is the most beautiful passage. A man who has been waiting for this moment, sees his faithfulness fulfilled. He was waiting for God to come, and now he can die in peace. God has done as he promised. Simeon has seen it. He knows that this child, placed in his arms, is the one. This picture encapsulates the look on his face, he knows and he is blessed. Along with Maggi (p144), I wonder, in his waiting how many children, and probably adults too, he has cast his eye over – wondering if they were The One. Was this him? Now his time of waiting is realised. It was not a vain hope. God is good. God is true. This takes me back to the very powerful Day 1. God is there whether I realise it or not. Whether he’s where I’m looking or not. He just is there. And God continues to be there, here, however we feel, wherever ‘here’ is. Jesus is for life, not just for Christmas. He is the fulfilment of our hopes and dreams – and the reality of our everyday – every day. We may not know what this years holds. We may have hopes, we may have fears, we may have expectations, we may have realities to face – but in each and every one of them – God is here. Let’s not spend so much time longing and waiting, that we miss Jesus when he is right in front of us.